Capital city Delhi has its fair share of markets. The capital takes care of your culinary delights at cheap prices. You can walk around these famous markets and stop for some awesome meals or snacks and feel immensely satiated. That’s the idea of food walk and we’ve tried to cover 5 markets where you can shop till you drop and the points where you need to stop for your hunger break and gorge some mouth watering food. Chadnichawk is the place to chomp in hot and spicy chole bhaturey, paranthas, jalebis, chaat and the finest of Indian snacks and delicacies. You have the famous Paranthe wali Gali where you can eat the best paranthas of Delhi. Chadnichawk is also heralded for being the benchmark for Indian sweets, all thanks to more than century-old shops such as The Ghantewala Halwai. Other than that the busy, congested old marketplace is a treasure of Indianness preserved in its true essence, one can find the best of Indian clothing, food and other stuff across the outlets along the roads, as well inside the dingy bylanes. Chadnichawk Market is one of the most popular food walk destination in old Delhi area. In Delhi, if one is preparing for a wedding in the family, it is a matter of pride to boast the shopping has been done from Chandni Chowk. The market has also the pride of India, the Red Fort, in its vicinity. Visiting the Red Fort and then eating out and shopping in Chandi Chowk can be a quite a picnic for a couple, family or friends. Other popular shops and eating outlets of Chandni Chowk are: Bishan Swaroop (for chaat), Chaatwallah (famous for fruit chaat), Dariba, a market for all kinds of precious metal jewelry, with stores such as Hare ram Hare Krishna and MM Jewellers. Nizamuddin is an area that lies to the left of Nizamuddin East (that has the prominent Hazrat Nizamuddin railway station). There is a famous “Ghalib Kebab Corner” that’s famous for kebabs and also home to the Persian poet’s grave. Alongside is even more popular eatery -Dastarkhwan-E-Karim, popularly known as Karim’s, a great Mughlai restaurant that serves Indian delicacies in a traditional wood-paneled dining room. Other than that, there is another restaurant by the name of Nasir Iqbal Restaurant. However, Nizamuddin as a place is thronged for the amazing Mughlai food and visiting Karim’s. Not to mention, the famous Humayun Tomb is also a part of Nizamuddin, that can make for a great weekend picnic for families with kids. Connaught Place is the largest commercial center of Delhi. Built in 1933, the pre-independence era, it is centrally located and is home to several offices, shops, bars, restaurants etc. It also features Regal, the first cinema hall of Connaught Place built by Sir Sobha Singh and designed by Walter Sykes George. Connaught Place also features Delhi’s first underground market, Palika Bazaar.There is an old Hanuman Mandir, which was built after a Hanuman statue was excavated from there. Opposite to Hanuman Mandir is the famous Coffee House which is Government run subsidized restaurant serving good quality food. For a good walk, one can hang around in Janpath and pick hot burgers, paneer pakoras, cold coffee from D’ Paul’s, the famous snack shop at Janpath. These snacks are an absolute value for money and not moderately priced. The paneer pakora and cold coffee are the trademarks of D’Paul’s. Dilli Haat is one not to miss market that has stalls from various states with not only their ethnic products showcased but also amazing food on offer. Dilli Haat is the most favorite place for youngsters and foreigner for food walk and hangout. 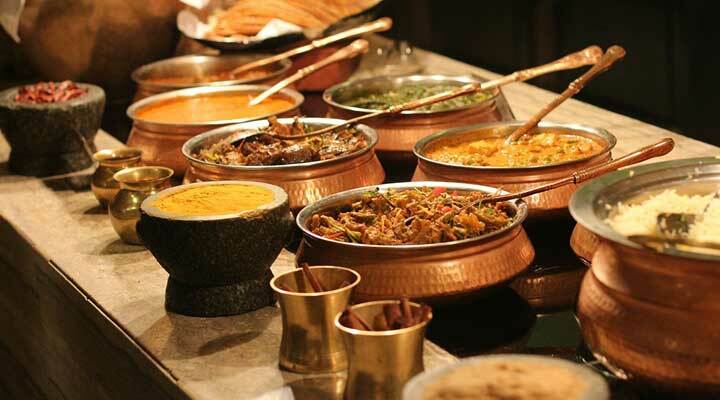 You can walk around and break for a mouthwatering meal, the choice is available from each state of India – right from North Indian thali to Rajasthani snacks to authentic Hyderabadi biryani, Kashmiri goshtaba, roganjosh and yakhni, and even cuisines from islands of India such as Lakshadweep etc. You almost feel like you are celebrating the festival of ethnic food and culture when you roam around Dilli Haat. It is situated in INA (South Delhi), near All India Institute of Medical sciences. Dilli Haat has a nominal entry fee per person. Tibetan Monastery Market is an amazing atmosphere to relax, walk and gorge on delectable momos. You can shop for the cheapest sweaters, jackets, sweatshirts and a whole lot of bags and Buddha artifacts from here. A lot of stuff, unisex and for guys are available here. Overall a supremely satisfying place with amazing authentic Tibetan food such as Thukpas, Chow Mein and Momos.Popular restaurants are: Zomsa, Wongdhen House and Shakura. Thank you Varun for stopping by..
Hi Veidehi, Thats a very good idea!